The University of Wyoming Outdoor Gear Swap will take place Saturday, Dec. 6, from 11 a.m.-1 p.m. in the Wyoming Union Ballroom. For people purchasing items, cash and checks are the only form of payment; credit cards are not accepted at the swap. McCoy encourages people to plan ahead. “Not only will there be items submitted from Laramie community members, but local outdoor equipment stores as well. All local retailers are invited to participate,” McCoy says. Individuals interested in selling equipment must come prepared to tag, price and fill out receipts for all the items they submit during check-in times only. “’Price it low if you want to see it go’ is our motto,” says McCoy. 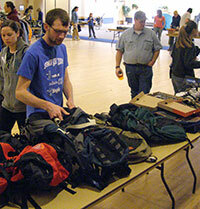 Gear check-in is Friday, Dec. 5, from 6-8 p.m. or Saturday between 8-10 a.m. in the Wyoming Union Ballroom. Unsold gear must be picked up by the sellers Saturday after the swap between 1-3 p.m. The Outdoor Program takes a 15 percent commission for items sold. For more information about this or other Outdoor Program events, call (307) 766-2402.